It's like SPF50 for your leather! McKee's 37 Leather Guard UV50 is a high-tech sealant for leather surfaces. Engineered to protect against harsh UV rays, McKee's 37 Leather Guard also prevents against dye-transfer caused by blue jeans, resists wear and tear from everyday use, and can even be used on vinyl and rubber surfaces! 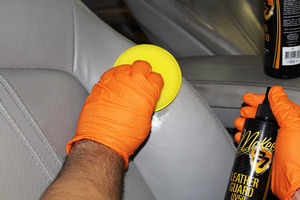 Just like you would seal your paint against sun's harsh UV rays, use McKee's 37 Leather Guard UV50 to seal your leather! Just because your leather surfaces are inside your vehicle, doesn't necessarily mean they're protected against the sun (even in tinted vehicles). You already know how important it is to protect your plastic and vinyl dashboard from the sun using interior protectants and sun shades, and it's time you did the same with your leather surfaces! McKee's 37 Leather Guard UV50 seals your leather and protects the delicate finish from the harsh UV rays produced by the sun. But that's not all McKee's 37 Leather Guard UV50 protects against. While the sun is the number one culprit of leather degradation, repeated abrasions (even the simple act of getting in and out of your vehicle counts) across the surface can start to wear the leather's appearance. 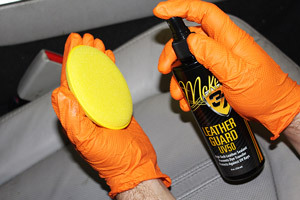 McKee's 37 Leather Guard UV50 resists this wear and tear and keeps your leather protected! Spray McKee's Leather UV50 directly onto a foam applicator pad and work into the surface using a circular, overlapping pattern. Apply more as needed and wait 1 minute before buffing off with a clean and dry microfiber towel. Another leather finish killer? The dye that gets transferred from your jeans to your leather seats when contact is made. Especially with dark wash jeans, the dye that is used is easily transferred and can quickly stain your lighter leather surfaces. McKee's 37 Leather Guard UV50 prevents this dye-transfer from happening! Hop in and out of your leather interior without worrying about dye transfer! McKee's 37 Leather Guard UV50 is to leather what Wolfgang Deep Gloss Paint Sealant is to paint - it seals against the elements and keeps your leather protected from everyday wear and tear. Do not apply McKee's 37 Leather Guard UV50 to leather surfaces that are hot to the touch. Thoroughly clean the leather surface with McKee's 37 Leather Shampoo 70/30. Spray McKee's 37 Leather Guard UV50 onto a foam applicator pad and start working the product into the surface using a circular, overlapping motion. Apply more as needed. Wait 1 minute after application, then gently buff off using a clean and dry microfiber towel. Do not apply McKee's 37 Leather Guard UV50 to suede surfaces.